Busy day, spent the morning doing crafts with Vince and Edda. In the afternoon as the house was being cleaned, we went a few MRT stops over to Causeway point and went to the Woodlands library, made a window cling, got more supplies for crafts the next day and ate at Mos Burger which is, I think, a burger chain owned by the Japanese. The cook to order, so the fries were hot, hot, hot. And yummy, yummy, yummy. I've finally started cooking again and it's been a week of good dinners. Tonight's dinner, fish tacos with red cabbage & lime juice slaw. Just finished this book, first book by Jules Verne that I've read. I was a bit confused reading it because I knew that it had been made into a movie starring Jackie Chan and the main character of the book, Philas Fogg, is suppose to be this stoic Englishman and I was like, who would cast Jackie Chan as a stoic Englishman. Anyways, I finally figured out that Jackie played the sidekick who is suppose to be a gymnast among having other interesting talents. The book was quite good. Reminds me that I should read 10,000 Leagues Under the Sea. Wow. So basically, my project lead decides on Wed to do my part of the project for me without tell me. WTF? I'm a bit miffed to say the least. Back to twiddling my thumbs. Today the kids and I went downtown to a play - The Ugly Duckling. A million kids were there from the German International School and after I paid more than 50 bucks for three tickets, Vince started flipping out and he said he wanted to go home. But I managed to coax him, with the help of an usher who assured him that it wasn't scary, to sit through a rather nice puppet rendition of the fairy tale. Sheez.... went all the way downtown on the subway and then retreated back on a taxi. Jeremy got me a bouquet of yellow flowers for our anniversary and we wanted to invite our neighbors over for dessert, but at 8:30, everyone else was eating dinner and not yet ready for dessert. Oh well, eventually one of our neighbors came by at 9:45 pm or so. It was really nice talking to them. Six Knitting books are headed your way. I'll email our address soon. Happy Anniversary Dinner: Seven Years today! When did Donald and I start walking? Vince started walking before his first birthday and Edda is now almost 18 months and hasn't started walking yet, which is pretty late. But she has the characteristic Lee duck feet which Vince doesn't have, so if you guy can remember, that would be a nice reference. Also, I would like the recipe for making dumplings when you have the time. Yes, it's our anniversary tomorrow. We celebrated today by making a nice chicken dinner with rock-shrimp sauce. Jeremy took a picture of the dinner, it was so impressive. Vince is getting to be handier around the kitchen. We let him pour ingredients and wash the vegetables, basically anything that doesn't involve a sharp knife or an open flame. 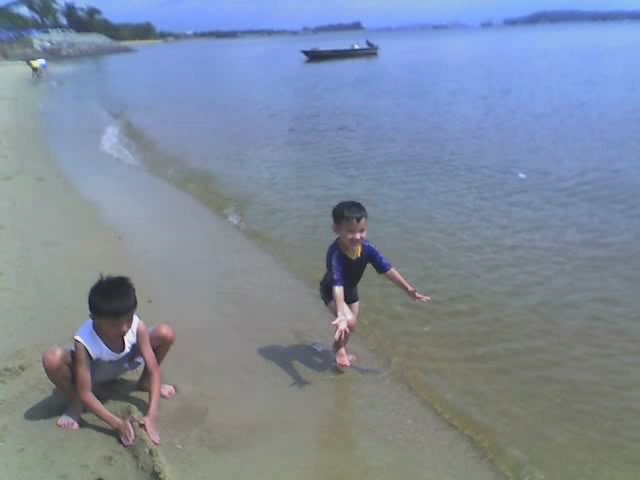 We had an amazing day, woke up early and went to Pasir Ris park all the way on the other side of the island. We took the subway and it took us 24 stops. We thought it might be a nice place to take Ruby and it is a very nice place for doggies, but it does take a while to get there and without a car it's hard to imagine Ruby getting there. Vince got to play in the sand and in the water at the beach. 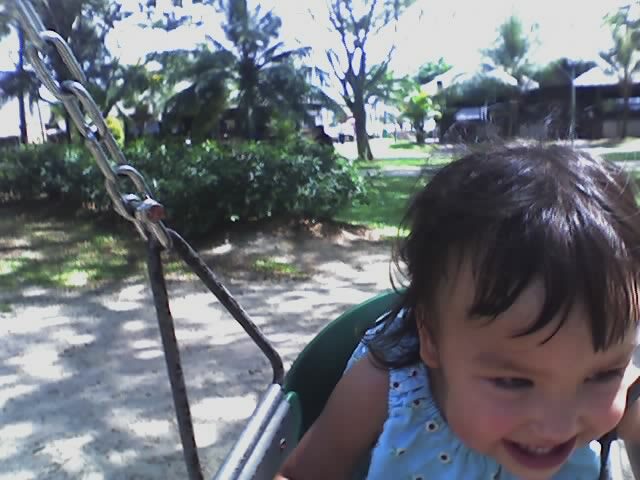 Edda enjoyed her swing time at the park's swing set. They have nice bike paths and a bike rental place with tandems and kiddie bikes, but it looks to be strictly BYOH (bring your own helmet). Then we took a taxi to the Takashimaya, the primo shopping stop for Jeremy and perhaps for the rest of Singapore as well. There sure are a lot of white people shopping there. There's the Bulgari, the Tiffany's, Cartier, etc, etc, etc. It's pretty hilarious to see all these Asian people all done up with the fancy hair that's so light, it's almost blonde and wearing blue eyeshadow. We bought chopsticks, rice bowls and a spatula to flip our pancakes. Then we took a bus home, this was Vince's call, I think Jeremy and I would have preferred a taxi, but V-man was keen on the bus. Vince really wanted to sit in the way back of the bus and was pretty determined to squirrel through people's legs to get to the back, but it was standing room only and no way were we getting anywhere past the 3rd row of seats. Now another work week, Vince is growing fast, eating a lot. It is residence day at the Warren Condo Complex. There has been syncronized swimming performances, guess the guppies, cotton candy, popcorn, carnival games. All fun under the hot, hot sun. We spent about 15 minutes are the festivities and then decided to bail because it was so incredibly hot. Instead, we went to Cold Storage grocery store and stocked up. I'm getting all antsy just cooking meat with garlic and onions, so I bought ingredients for 4 dishes from the only cooking magazine I have, Gourmet. We'll see if I have enough energy to see it through. Vince and Edda just put Jeremy down for a nap. Jeremy had a pretty busy and productive week at work. Well, we gradually are settling in Denver. We found a nice economical community pool and swam twice a week. During the weekend, we are seldom in our efficient studio. We traveled a lot to see different places. Next weekend, a long weekend, we are planning to visit several National Park in Utah. Well, this is golden time for us. Together almost every minute :) and we really enjoy it. So I got us some goldfish today. With a bubbler because Jeremy wanted one. 2 fish which Vince wanted to name Vince and Mama. We thought that was a bad idea, so now they are named Zilker and Zepher. Vince and Edda are eating! Finally! Can't sleep. Can't sleep. Oh well, I drank some Coke at dinner, bad news. Went to a quilting store with Julia and Mathilda today. Today we spent the morning at one of our neighbor's apt. There are 3 other apartments on our floor and I'm getting to know all the neighbors. Today we went to Ann's house. She is a housewife and her kids are grown up and married. She has a cute rabbit named Porky. Edda and Vince loved playing with Porky. Ann is also a good cook. I'm glad to have her as a reference, some of the recipes here I don't understand the ingredients, but she'll tell me what to look for at the supermarket. We did not have to work last Friday. Every other Friday is off day. We left ar 4:30 Thursdat afternoon from office to Salida? a small town. Stayed at local motel and had nice dinner at local restraint - the motel manager told us. It is the only good rastraint in the town called "Laughing Lady". There were lots of people. We had our dinner at padio over look the montains. I ordered soup and fish. Daddy had steak and red wine. The food was very good. Later, the waiter told us the cook came from Napa Velley, CA. As a mater of fact, the cook greeted us when we were waiting and later he showed us the table. The desert was very good too. we only ordered one we shered. Next day (Friday) we went black rock national park, Mesa Verdi national park, and four corners. We took picture with two hands two feet covered all 4 states. (UT, CO, NM, AZ. We stayed at four corner casino and played $10 slot for half hr. It was even. no win no loss. Saterday we came back and stopped at Sand dume. It is smaller (but still very hurge one) than the white sand in NM ( May be in TX). They formed differently. The white sand was ocean shore. The sand dume in CO is formed by river, wind and mountains. Daddy drove 1100 mile total. Well, today is our 35 years of marriage. We have known each other for 38 years. Looking back, just have "yuan feun" as Chinese often say. In there, there are a lot of "sour, sweet, bitter & spicy" stuff and they have all been worked out very well all along. Mom is pretty "exceptional" and me "too" :) BTW, Doris, thanks for calling. oh doris, btw I was thinking about getting arif and tahera a milkshake machine. what do you think? also something weird, I checked the card yesterday and apparently it has $43.65. is that supposed to be correct? sorry I don't have much time these days to post. It's going to be a busy week.... I'm the officiant (or priest) for my friend Choon and Pei-Sun's wedding coming up in the middle of october, so I have to come up with something to talk about... Since I don't know anything about marriage, I thought I'd ask you guys if you had any advice for the key to a good marriage? Do you have any specific advice for Choon (the guy)? or Pei-Sun in particular? Any advice for kids? what's the hardest thing about marriage? what's the easiest? ps. I'm thinking about buying an $800 hugo boss suit. arg. Another Monday... Jeremy had to go out to dinner with his company so we were on our own for dinner. He went and ate chilli crab and we had raviolli. Every Monday, Vince is exhausted from the weekend, so he went to bed pretty early. We had a nice playdate with my friend Annie, who used to be a Singapore airlines flight attendant, and her kids Emma and Sarah. So I'm trying to branch out and read books that I normally wouldn't read so I checked out two books from the library, Book Lust and So Many Books So Little Time. These are pretty interesting, just lists and lists of different books to read. The lady who wrote Book Lust is a librarian in Seattle who has radio shows about books and such things, she actually considered going for an advanced degree in linguistics with Noam Chomsky at MIT, but decided that being a librarian is what she loved doing. Pretty cool. Speaking of librarians, I was wondering if my little brother got together with Stella Ota, my favorite librarian. It's great that Ruby's home, she was really happy to see us. They must have let her eat whatever she wanted in quarentine, I mean the feed bag must have just been full and open, because she is one huge, huge dog. Labs are just incapable of controlling themselves when it comes to feasting. Raymond and Yvonne and her 2 kids came over. It was really nice. So last night, Vince just puked and puked. And then 3 hours later, he had to pretty much sit on the toilet all night. And as soon as the sun was up, he was fine. What's the deal with the late night stomach troubles? Do they never show up in daylight. I have to hand it to Jeremy, he got puked on this week by both Edda and Vince. Somehow I didn't even get a splash. I had to send 2 down comforters, a down pillow, a rug and a quilt out to the laundry to clean them. Disgusting. We will be back on Saturday and, Sunday, I need to fly back to DC. Will be back to Denver Tuesday night. Last night, we went to swim. It was a nice pool. Yup, 15 years since I've graced the halls of Wootton High School. Shudder. I got an email in my inbox today. I'm so old. We spent a low key day at home today, going to the library and the mall. Vince and Edda are finally both well and getting enough to eat and sleep so everyone is doing much, much better. I was brave and called my potential friend, Annie, up and invited her over this morning, but she was headed to IKEA today to shop with her hubby. He's a steward on Singapore airlines so he just came back yesterday for a few days off, so I figured she would be going out with him today. I hate calling people and asking them if they'd like to do something, even though they have made it perfectly clear that it's OK to do so. I'm concentrating on this more and trying to make more of an effort to do so. I'm happy to report that Vince is coming out of his I hate school mode. We talked a lot about his old school this morning and thinking about writing letters to his old friends at school. And this afternoon, he filled up his backpack and his water bottle and went to pretend school for a good 15 minutes or so. It was really nice to see, he had been shunning his backpack and was willing to give Edda his waterbottle when she needs it for her school because he planned on staying home. Hrm. I found a neat little lunch place today. It totally reminds me of Gooseberry's from MIT. It's an asian food truck parked outside the student union called NetAppetit. It's 6 bucks, which is cheap on campus, and it's a buffet. You can get whatever you want as long as it's under 30oz, which is a hell lot of food. The crazy thing is that buffet is actually inside the truck, so there are like 5-6 people cramped inside trying to grab food. Not the easiest thing to do, especially when you're holding a Coke and a Powerbook. So keeping the kids happy means feeding them every 2 hours. They don't actually eat enough in one sitting to make them full for longer than that amount of time. Today Vince and Edda had a meal at 8 am, 11 am, 3 pm, 4:30 pm and 7pm. Crazy. We had to get out of the house between 1:30 and 3:30 pm today because our housekeeper, Rukia, came by and cleaned. 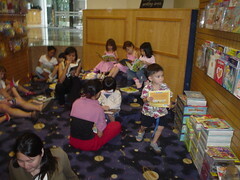 We went to the Causeway mall and bumped into Matilda and Julia. Boy, we partied with them, made a craft and also had ice cream sundaes. Yum. I'm exhausted, but of course, once the kids are asleep, I want to stay up and hang out! The home of the 6-hour playdate. Matilda and Julia came over today at 10:30 in the morning and we played and swam until 4:30 pm. Wow, what a day! The kids had a lot of fun, mainly playing in a huge cardboard box. Julia is good fun to have around. I ogled her real Louis Vuitton backback that she got from her hubby for her birthday. Edda is still a bit unenthusiastic about eating. Other than that it's going to be a pretty busy week. I've got so many things on my agenda this week. Plus I'm trying to not go out to eat this week to pay for that 300 gig hard drive. sigh. I realize that a lot of my time these days is taken up thinking and researching what stuff i ought to buy. It's somewhat depressing, but somewhat it's great cause I couldnt' afford these things for so long! So I'm consumed with consumerism. nice. Hopefully I'll get together with Choon this week. His wedding is coming up. I suppose I ought to shopping for a suit too since i didn't manage to get one for Arif's wedding. Friday will be poker tournament 4. Hopefulyl this time i'll come out with the top prize. muahhahaha. where is that dang bus? Biking down a straight road at 40mph or some soccer mom driving a 3500 lbs car, with her kid in the back seat, trying to get the attention of said biker to tell him that he's going 40 mph? laff. this happened to me on saturday. get a grip people. In order to ward off feelings of lameness and stuck-at-homeness and encouraged by a quickie call to my brother, Vince, Edda and I went out on the town and spent money like crazy. OK, really just semi-crazy. I went all over to the other side of the island in search of a 3-story indoor (air conditioned) playground and I didn't find it. It was pretty lame looking around a mall and asking a bunch of people with kids where the indoor playground is and have them all look at me real funny. Vince was not convinced today's 3 different cab rides were worth the effort. We went to the Tampines Mall, the Suntec City mall and then home. 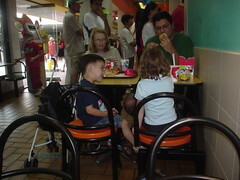 We ate at McD at the Suntec City mall and Vince declared that he missed the McDonald's in New York. Vince is kind of hard to manage these days, he won't go down for a nap easily. I can spend two hours in a darkened room with him and he just won't nap, my usual rule is no napping after 4 pm which results in an 11:30pm bed time. Without a nap, he's flipping out at 5pm. I really should get on top of the food as well, I have to get back into feeding them every 3 hours or so. I'm still not familiar enough with the grocery store to get them the things that they'll eat, I'm usually rushing though trying to get dinner together and not concentrating on what is actually on the shelves. I've been here almost 3 week and I've gone grocery shopping at least every other day and I just realized tonight that there is no pasta in my grocery store. On a good note, I met a potential friend! I'm so excited! 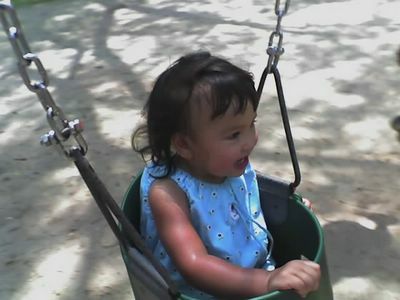 She has two girls, ages 4 and 2 and she lives in my apartment complex and within 5 minutes of meeting us, she invited us over tomorrow. And tomorrow we have a playdate with Matilda! Mom and Dad went there today. We even took pictures. It is a nice place for Honeymoon. Good picked. But, we did not stay. You would like to lunch there. But, no food there. Tomorrow, we are going south. I just finished Aloft by Chang Rae Lee. Thumbs up! Chang-Rae Lee's third novel brilliantly evokes the angst of a man stunted by his own passivity. Jerry Battle, by his own account, is not a fighter. He flies his airplane in only the fairest weather, and usually does so solo since from that height, with no one making demands on him, "everything looks perfect." On the ground, though, his life is less than perfect. He would rather let the woman he loves live with another man than express his true feelings for her. He turns from the implications of his son's extravagance in running the family landscape business, and he prefers to keep his distance from his gruff father. If Jerry sees the signs of imminent destruction, he keeps them to himself, for to bring them to the fore would be to require action on his part. In fact, the last time in his life when he took charge of his personal life, he pushed his wife and the mother of his children to her early death. All in all, he'd rather not know about the crises embroiling his family. However, when his adult daughter breaks some distressing news, all his carefully constructed aloofness begins to crumble. With wit and insight, Lee has created not only a memorable character, but an unforgettable novel. The interior nature of the first person narrative might disappoint readers looking for more pizzazz to the plot, but the intimacy created as Jerry leads the reader through his thoughts - on everything from his young wife's death to his father's "years of being a pigheaded domineering irascible bull in the china shop of life" to his tender. confused feelings for his son and daughter - makes up for the lack of action. The emotional depth Lee provides is stunningly full. Although the imagery can be heavy-handed with its references to flight and being grounded, Jerry's wry acknowledgment of these elements rescue them. The decadence of contemporary culture and the melting pot of Long Island provide strong foils to this novel essentially about a fifty-nine year old man coming of age. Admittedly, this excellent novel is not for everyone. Its detailed examination of mundane but revelatory moments might get tedious for some. However, for those who like the quiet realism and intimacy of a man's struggle against his own nature, this will be one of the best novels of 2004. Um, the train is leaving on the other platform. Should we change over? I'm tempted, but we'd have to get the super dooper package to have everyone be able to blog. Mama, are you falling out of love with daddy yet? Because I want to marry you. Can we go to a wedding tomorrow? A big wedding? Vince told me this today after he woke up from his nap. So it seems as if we have completely given up on Learning Ladder nursery school. I went from a full day to a half day and finally today, after sleeping more than 13 hours from 5:30pm to 7am, he was adament about not going to school. I love staying home and want to do it forever. I want to stay home night and day. Let me give you a big, big hug. I don't want to go to school ever again. Let's do something? Can we go to the zoo? Darling, why don't you put your feet up and I'll fix you a gin and tonic and finish washing the dishes. OK, the last line wasn't from Vince, but you get the picture. So tomorrow I have to call the silly school and tell them we aren't enrolling. And the school bus company to just bill me for the 2 weeks. Bleh! And now I have both children full time again underfoot. Sigh. and the weirdness is getting to me. All the things I find annoying about myself is apparent right in front of me. People cutting in line (usually an older Chinese lady who just dashes in front of you as you are about to checkout, she's found that she can squeeze into the space left by the person who just paid and you aren't moving fast enough to fill the space), people not helping with doors (I'm struggling with Edda in the stroller, usually up the stairs since there aren't a lot of elevators or through a door, and instead of holding the door open or helping with the stroller, people just find the quickest way around me further impeding my forward progress), a particular way a parent addresses their children, blah, blah... I'm homesick. On the good side, we heard from the quarentine people and Ruby is doing fine, and is due back home, not this Saturday, next Saturday. We've been looking at all the off-leash areas on the island and trying to figure out how to get to them. You aren't allowed to bring dogs onto the subway, but taxis are suppose to take them, but not the Muslims because they can't touch dogs, especially their tongues. Tonight we ate at a sushi place that has the little conveyer belt going around the restaurant and Vince had a great time. It was a pretty good trip. Sometimes I think travelling is not quite my thing. Or maybe it's just the way we travelled. Larry pretty much took the reins on this trip and he's quite a go-go tourist. So we had to hit all the spots, etc... I think I'm more of a chill out tourist. I like to relax and do some stuff and then take a nap in the afternoon. Somehow I didn't expect jet lag to be that big of a problem for me, but it took me a long time to readjust to the time schedule. It didn't help that we didn't get much sleep to begin with..
We stopped in Dublin first, which was short but sweet. Jeremy might appreciate that we went to the Guiness Brewery, which, I'm sorry to report, was the most pompous display of self promotion that I've every seen in my life. It was either that or I was really really really tired that day. They had something like 7 levels of "exhibits" extolling how they brewed the beer, but the last line would inevitably be, "well that was cool, but now we do it differently. (aka the cheap methods)"
London was fun. People are a little jittery about the Underground. There are no trash cans in the stations, and we had an evacuation one day. Akil, Arif's brother, got a lot of looks on the Tube holding a backpack. Otherwise the wedding was different. It was a 2 night affair. The first night was at the mosque where the men and women were separate. The women veiwed the whole thing on 3 lcd panels. :) Arif was his own representative and sweated thru some arabic, and sat thru I don't know how many photos. Arif thanking a woman who sorta arranged things behind his back. Tahera. Tho I wasn't happy about that. Big Tahera: But you're happy about it right now? Arif: Ask me in 2 years. :P All the friends that knew Arif laughed about it. We know that he means well, it just was poorly formed. heh. Hi, from Denver. We are gradually settling down. Tomorrow, we are going to invite our friend's kid to have dinner together with us here. He was very helpful to find aparments for us. We plan to walk together every evening, doing exercise sort of. Jurong BIRD BIRD BIRD park. BIRDS are everywhere. Today we went to the Jurong Bird Park with Matilda and family. It was hot, hot, hot! The highlight of the day may have been the air conditioned McDonalds or the air conditioned monorail ride. Today was Singapore National Day, so Jeremy had the day off and we all dressed in red. Vince was more impressed with Singapore National Day than he was about the 4th of July. The house is coming together, the landlord had bought a whole bunch of white furniture and we needed some more color in the rooms, so we got a bunch of crazy colored rugs from IKEA and moved them in. It's feeling more and more like our house. I'm having a hard time cooking here. 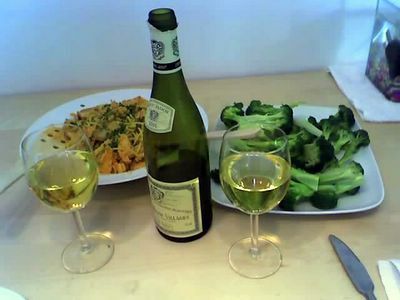 In the US, I was getting more and more ambitious with my cooking, using exotic ingredients and different techniques. Here, I'm still familiarizing myself with the layout of the supermarket and all the weird stuff they sell there. I've been looking at local cookbooks, but the ingredients are strange. We've been having pretty simple dinners here and eating out a bit. Got a 12" Gary Fisher bike which we rode to the McDonalds for a late night snack. Ice cream which starts to melt and drip down your hand and arm even before you get to your table. Yum! I've got a @#$$! stomach bug. I woke up this morning with a pain in my bladder, I've been battling a mild UTI, but it had pretty much cleared up, but I got up to go to the bathroom and I could feel the blood rushing out of my head and I got really light headed, I hadn't felt this bad in a while. But after a good time on the loo and a long hot bath, I feel fine, just peachy. I'm still a bit queasy, but otherwise, no fever, no more cramping, I even managed to eat some lunch. Could I be pregnant? Nooooo.... not a chance, well, hardly a chance. Jeremy's out with Vince buying the bike that he had his meltdown about almost 2 months ago. Vince has not for a minute forgotten our promise of getting a bike in Singapore and he ogles every bike he sees and whenever he sees any for sale, he's there. He's THERE! I pretty much opted to stay home as I like the security of a toilet less than 20 feet away from my body. Vince is almost 100% better, so maybe 85% or 90%. That would be 9/10 better or 85/100 which could be simplified to by dividing the numerator and denominator by 5. He's still coughing a little, but the fever has left for another world. Well, we are here and this is my 49th States where I have visited. The only States that I have not visiited is IOWA. So Vince got sick at school today and started mumbling about wanting to go home, so I picked him up in a taxi at about 3 this afternoon. He's a bit sick and homesick at the same time. I have a feeling that I'll pull him from the all day childcare and have him come home after lunch. This 8-5 deal is too much a shock to the system. Today, I welcomed Rukia into our house. She's our new housekeeper who will clean the floors and the bathrooms and kitchen once a week. We discussed the time and what equipment I'll need to purchase. I told her about Ruby... She's Muslim, so apparently you aren't suppose to touch dogs, especially their tongue, so I guess Ruby and Rukia aren't going to be spending much time together. I made sure that touching dog hair wouldn't be a problem. Apple makes a two button mouse! Ready for Arif's Big Day! I'm taking off to Dublin tonight with Ronnie, Larry and Josh. We're slightly disorganized and I'm not sure really that any of us are super sophisticated travelers. I think we're just staying at the hilton or something. Laff. Anyhow. It should be fun. We're getting to London on Friday, and Arif's "Big Moment" will be on Saturday. There's going to be a Dinner on Sunday too. I'm not sure where this leaves us in terms of doing things, but hopefully during the day there will be a lot of time. Yeah.. Interesting.... we'll see how it goes. So today I arranged for Jeremy's shirts to be laundered. I called a phone number and they were at the apartment within 30 minutes and the shirts will be clean in 4 days. Woo hoo! I never have to leave the apartment. I was a little worried about Vince and his school because yesterday there was some sort of "accident" with a scooter and Vince ended up crying and the teacher told him not to cry and that only babies cry. Hmmm, not exactly an American reaction... Vince repeated the crying line a few times during the evening, it seemed to trouble him, so I was worried that he was a bit stressed at school and that the 8-5 schedule was going to be a bit too long. But he tumbled out of the bus today happy and telling me he had a good day. Edda appetite is continuing to improve. She seems happier these days in quite a while. She ate most of a pork chop and was cheerful and happy. The school bus is here! The school bus is here! So, now I'm relegated to waiting in front of the complex for Vince to come home at 5 pm. This is what I got out of him today. There was some argument today with his teacher over a scooter, some sort of accident and crying and not crying. There was a shower. There was the performance of "The Hokey-Pokey". There was a discussion of shapes. The peas and carrots and rice for lunch were good. The cream puffs were the bomb. There were mushrooms being made and left at school. Nap time did not result in a nap. A good day overall. Edda really enjoyed her day at home with one-on-one time. She was especially pleased at the spaghetti dinner. Thank goodness we are starting to eat at home again. She's been eating less and less since we moved to SGP, she was sick last week when Jeremy was out, so now things are improving. Jeremy made a dash to IKEA, again, this time without the kids and I think we have pretty much everything we need. Of course, everything he picked out is orange, the color of Jeremy. I explored a little bit more, I found the post office (long line), I found a music school, Vince and I can start piano lessons whenever we want to. I just came back from a nice swim in the huge pool right outside my window. I'm so pleased with our internet phone.